Gerhard is best known for his work on Cerebus with Dave Sim. A 300-issue series, it is a milestone in comic book publishing as the longest running creator-owned comic book series! 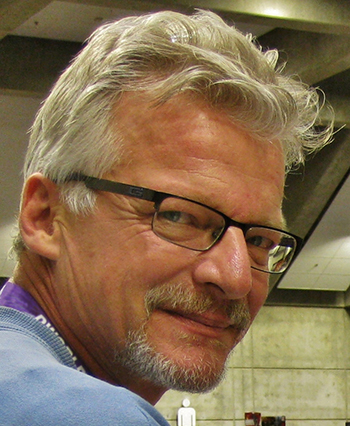 For 20 years, Gerhard worked as background artist, environmental designer, and cover colorist on the Cerebus graphic novel which has been hailed as, “one of the most sprawling pieces of visual fiction ever created.” His designs and meticulously crafted drawings served to ground even the most fantastic of events, or drastic of stylistic shifts. Under the pressure of a monthly deadline, he honed his skills using the crosshatching technique which has become his particular style and has gained him acclaim throughout Canada, the U.S. and the UK. Since completing Cerebus in 2004 he has been exploring other creative endeavours including doing commissioned work through his website, GerhardArt.com; contributing to the awesome Winsor McCay tribute book: Little Nemo, Dream Another Dream; doing a variant cover of The Walking Dead, and most recently, illustrating a Grant Morrison story Smile of the Absent Cat for Heavy Metal Magazine.